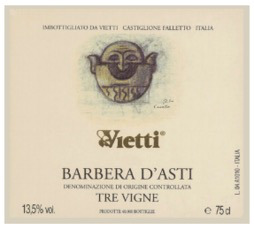 Wine Vietti Barbera d’Asti Tre Vigne 2016 - Royal Wine Merchants - Happy to Offer! Ruby purple color with ripe red cherry aromas with hints sweet spices. A dry, medium bodied red wine with refreshing acidity, the Barbera d’Asti Tre Vigne is well-balanced with good integration of oak, good complexity and a long finish of red cherries.